This is from my newest Parenting E-book which I am editing. It started as a course I gave to NYC parents charged with child abuse. All the best research shows discipline is important in helping a child do what is right. Discipline teaches obedience, respect for authority, social skills, and self-control. Learning to abide by society’s reasonable rules is an important step in developing a sense of being a good person. Activity, exercise, or a regimen that develops or improves a skill. Parents and care givers are responsible for seeing that children learn what is necessary to move ahead in the world outside the family. This requires learning to obey reasonable rules. Those who interact daily with children are responsible for providing a regimen that develops obedience to reasonable rules. Finally, parents and care givers punish children when children do not follow rules. Parents and care givers are responsible for seeing that children learn what is necessary to move ahead in the world outside the family. This requires learning to obey reasonable rules. Those who interact daily with children are responsible for providing a regimen that develops obedience to reasonable rules. One school of parenting advice rants against the idea of punishment. This schools prefers to focus on rewarding proper behavior. Another school of disagrees. There is some right in both stances. Punishment is defined as pain inflicted after behavior for the purpose of changing or shaping that behavior. Rewards are defined as something pleasant or desirable given after behavior for the purpose of changing or shaping that behavior. According to these definitions, not giving a reward is a punishment. You punish whether you intend to or not. At the same time, harsh physical punishments are more harmful than helpful. The path between these two approaches is most likely to lead to success. The following rules of discipline help you walk that path. Rule number two: if you expect the child follow the rules, you must follow the rules. When disciplining a child, adults must remember children pay more attention to what we do than to what we say. Besides if you can’t obey the rule, why is it important for the child. Some rules are more important for children to obey because children do not have the skills and judgment an adult has. For the most important rules, however, if you cannot model them for a child, do not expect the to abide by them. Rule number three: remember Age and Stage. Discipline strategies that work for a toddler do not work for a two-year old. Five year olds need a different approach to punishment then ten-year olds and ten-year olds need different punishments than a sixteen year old youth. Babies must never be punished. Babies do need to be regularly fed, played with, helped to develop healthy ways to self soothe, and helped to gradually learn to sleep through the night. Toddlers need to learn the meaning of “No.” This starts by consistently saying “No” and taking gentle action to stop the child from doing the forbidden. Rules for this age should be designed to keep the toddler safe, to keep the toddler from destroying property or harming others including animals. Time outs should be in a loving adults lap, short, just repeating “No” and then directing the child to a more positive behavior. When a child has his or her first temper tantrum take the child to a time out space so her or she can calm down. Even when the tantrum occurs in a store or public place, the child can be placed in time out against a wall until the tantrum is over. A tantrum should not be given into. When the child has calmed down have the child stay in timeout for one minute for each year of his or her age. Then have child apologize for behavior (just saying the word “Sorry” will do at the beginning, but by the age of four or five the child should be able to say what he or she did that was wrong and be taught how to apologise properly. Once the child has apologized, hug the child. By the time a child can read, he or she can be expected to help around the house. This should begin in as the child walks with ease. Chores a child that age can do: putting toys away, placing dirty clothes in the hamper, helping put trash in the trash can. Time out combined with rewards remains the best form of discipline. Allowance can be as the child enters school. Most of an allowance should be earned, but some should always be given just for love. Teenagers need to be set free to learn from life. Natural consequences are the best form of discipline for a teenager. What is a natural consequence? A teen that does not get up on time in the morning will be late for school. A child who is late for school is at danger of being given detention. A child who gets too many detentions will not pass and will have to go to summer school. Loaa of privileges, however can and should be part of a teen’s world for violating parental rules. Rule number four: remember the child’s challenges. While all children are challenging, some face extra challenges. Parents/caregivers of challenged children need to know exactly what it is fair to expect of their child. What is the child’s emotional age? Is a sixteen year old really only able to think like a ten year old? Rule number five: enforce reasonable rules reasonably. Knowing the expectations for age and stage and the challenges facing a particular child, help with setting reasonable rules. The most effective discipline involves a careful and consistent use of rewarding proper behavior and punishing unacceptable behavior. Think about how almost every toddler in the world learns not to run into the street and does so fairly quickly. How does that happen? Because all adults run to catch a child running toward the street and let the child know in one way or another that is not allowed. Such behavior often gets the child’s padded=behind swatted and even by parents how have vowed never to hit a child. However, caring parents reinforce safe behavior by holding their toddler’s hand at street crossings and talking about keeping safe. Rule number six: reward more than you punish. Relationship experts have shown that a five to one ration of good to bad interactions keeps relationships positive. Smiling at your child with love in your heart as often as you can. Having “Tea and sympathy” time to just focus on hearing the child. Having a cookies and milk time as a night time ritual, no matter how bad the day. Saying thank you for every thing your child does that is helpful or showing effort. Having favorite comfort food for dinner when a child has had a Bad Luck Day. Having part of the child’s allowance be a love allowance. Allowances are important behavior rewards and not earning allowance is a useful punishments. Giving a generous allowance tied to good behavior teaches important lesions. Giving a small “Just because I love you” teaches an equally important message. Rule number seven: discipline with love not anger. When we are disciplinarians, when we punish a child, we should be driven by love, not anger. We need to hold to our faith that our children want to do what is right, just as we do. As we have learned the value of treating others as we want to be treated, of being honest, of trying to make the world a more just place for all, so will our children. On the path to learning the lessons we have learned, our children will make mistakes. It will help if our attitude toward those mistakes remains faith in every child’s ability to eventually learn what needs to be learned. Rule number eight: Admit when you blow it and sooner or later you will blow it. When you can apologize properly you are teaching your child to apologize. Being able to let others know you regret how you behaved is an important life skill. Best is to catch yourself blowing and begin the CARE Plan. C = Confronting unacceptable behavior. When you blow, it generally is because your last nerve has been stepped on. Usually, you blow loudly and then realize you have lost it. A = Allying with the child. Take a calming breath, remind yourself, the child is a child. R = Review what was not acceptable. Ask the child if s/he knows what lead to your losing your cool. This is a major step as children often stop listening once we yell and go into a defensive shutdown. The younger the child, the more likely s/he will not know what happened. For children who cannot yet read, if they cannot answer, answer for them. Be brief. One sentence should do it. “You didn’t stop when I asked you to.” “You were hurting your sister.” For older children and particularly teens if they know what behavior of theirs upset you, go to the next step. If they answer incorrectly ask again, give them three chances to come up with what they did and then tell them. E = Expect improvement and end on a positive note. With the pre-school child, ask if they are going to try harder to do what is right. When they agree. Thank them and give a hug. If they are not ready to agree, have them sit in time out until, they are ready to “Try harder to follow the rule.” Then give a hug. With the school age children and teens, expect they will accept the agreed upon punishment and then offer faith that they will keep trying to do better, and offer a bit of sympathy about having to follow rules. 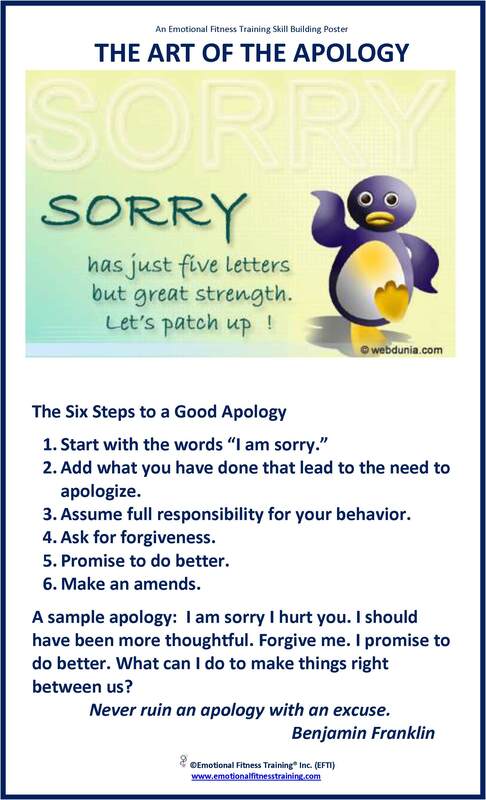 It also helps to do some direct teaching about apologizing. This poster coach provides all anyone needs to know to apologize properly. Next up: Eight steps to obediance . Parents need a many ways to discipline. The use of one method only is simply not effective. Some behaviors need to be stopped immediately, others can be ignored, others can be responded to gently at first in order to allow the child choice.